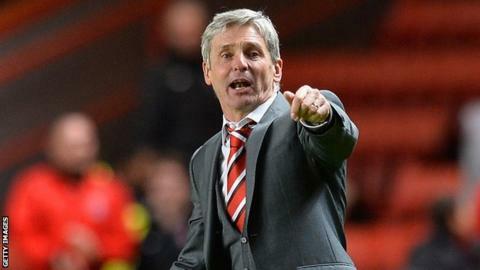 Charlton Athletic head coach Jose Riga is adamant he can lead the club to survival despite losing 2-1 at home to fellow strugglers Barnsley. Despite Tuesday's defeat the Addicks remain one point above the Championship relegation zone, with a game in hand on all the sides in the bottom three. Riga told BBC London 94.9: "We still have our destiny in our own hands. We have to believe. "Maybe it is strange but after this game I believe more than ever." Barnsley are now two points behind Charlton after goals from Jean-Yves M'voto and Tom Kennedy secured a win at The Valley. Riga has won four of his 11 games in charge since being appointed Charlton head coach last month and he is remaining upbeat about their chances of survival. "From day one I knew the calendar [of games] would be difficult," the 56-year-old Belgian said. "We are still the masters of our destiny and we have to manage it in the right way. "From day one I said to everyone it would be difficult until the last day. We are still above [the bottom three] and we want to stay there." Riga says the squad must maintain a positive mindset in order to avoid dropping into the third tier. "The pressure was present before the game and is still present after the game," he said. "I would prefer we would have made another big step but we have not made a step back. I don't see a team who don't believe [in staying up] and we have to stay this way." Charlton defender Richard Wood says the players must move on from the disappointment of defeat to Barnsley. "It was a big chance for us to draw clear and put us in a great position but we have got to look at the league," the centre-back told BBC London 94.9. "We are still in pole position. The coach is saying it is all about mental strength. We have got to stay focused, carry on and it will see us through."